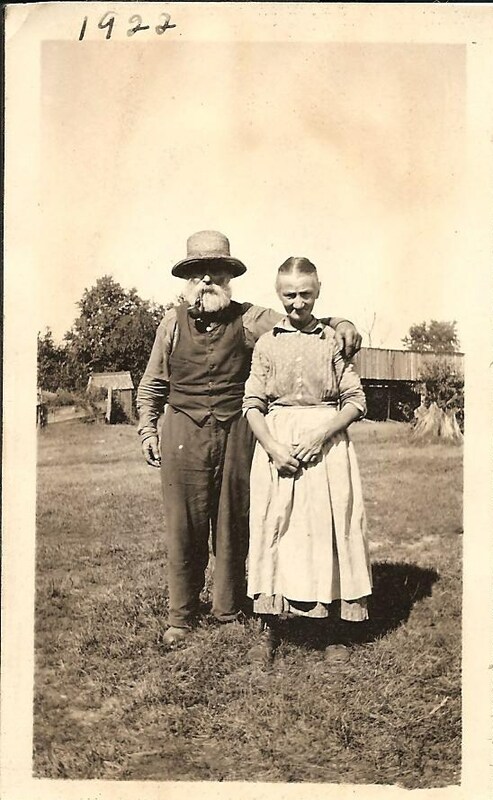 This picture of Addie and Len McKie was found in Hattie's Bible. Did you know that Battle Creek, Michigan is the birthplace of the Seventh-day Adventist denomination? I didn't either until I visited Historic Adventist Village, which is located on the west side of Battle Creek, just minutes from my home. Historic Adventist Village restores the history of the Seventh-day Adventist movement. It includes the neighborhood where early pioneers of the church lived and walked. The Adventist Village encompasses three blocks of restored buildings, including homes, a one room school house, meeting house, and church. Your visit starts at the Welcome Center and Dr. J.H. Kellogg Discovery Center. Visitors are welcomed by costumed workers who are very knowledgeable about Dr. Kellogg and the village. They will give you a tour of the village, including the inside of the buildings. Dr. John Harvey Kellogg is, probably, best known as the inventor of Kellogg's Corn Flakes cereal, which he invented along with his brother, W.K. (Will Keith) Kellogg. Dr. Kellogg was a medical doctor with an interest in holistic health. As the chief medical officer, Dr. Kellogg ran the Battle Creek Sanitarium using holistic health methods with an emphasis on exercise, enemas, and nutrition. The light bed concept was invented by Dr. Kellogg, who promoted better health through photo-therapy. Other inventions of Dr. Kellogg's can be found at the interactive Welcome Center and Kellogg Discovery Center. Seventh-day Adventist Church. A short movie about the church and the White family can be seen at the Welcome Center. They built this house for about $500 in 1856. It is the oldest known Seventh-day Adventist landmark in Battle Creek. It was restored in 2001. David was the first seventh-day Sabbathkeeper in Battle Creek. The school house was moved to the Village in 1999.
and Battle Creek College, which was the beginning of the Church's worldwide educational system. This church was the first Adventist Church to be legally organized. Parkdale is located in southwest Michigan, near Three Rivers, Michigan. The church was moved to Adventist Village and restored in 2002. A visit to the Historic Adventist Village is a step back in time. The heritage of the Seventh-day Adventist church is evident in every step. Tours are offered Memorial Day-Labor Day Monday through Friday (10-5) and Saturdays (2-5), with the last tour starting at 4. Labor Day-Memorial Day hours are Saturday (2-4). For more information: Visit the Historic Adventist Village website. The summer I graduated from high school my parents bought a house on Huron Avenue in Harbor Beach, Michigan. I didn't spend much time here. My freshman year in college I would come home for holidays, but that was about it. My family only lived here about a year. riding my bike through the golf course on my way to my summer job at the resort. The two story home had a kitchen, dining room, living room, bedroom and sun porch on the main floor. The upstairs had two bedrooms. There were one and a half baths, but I don't remember which was on what level. A full basement and detached garage completed it. I was reading through my blog list and came upon Jill Ball's The Bucket List GeneaMeme at her Geniaus blog. I thought I would give it a try. The genealogy conference I would most like to attend is... FGS, I went last year and loved it. The photo I would most like to find is... My great great grandfather Samuel S.Glover, Jr. The brick wall I most want to smash is... Who are Daniel Fenn's parents? 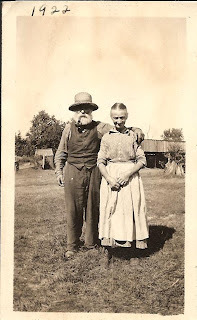 The genealogy blog I would most like to start would be about.... My husband's family-Journey to His Past! The ancestor I most want to meet in the afterlife is.... a tie-Hattie Fenn Glover of Hattie's Bible Fame and Samuel Stillman Glover, Jr.
(Washington, D.C.: U.S. National Archives and Records Administration). As genealogists we look at a lot of records, sometimes with detachment, I think. 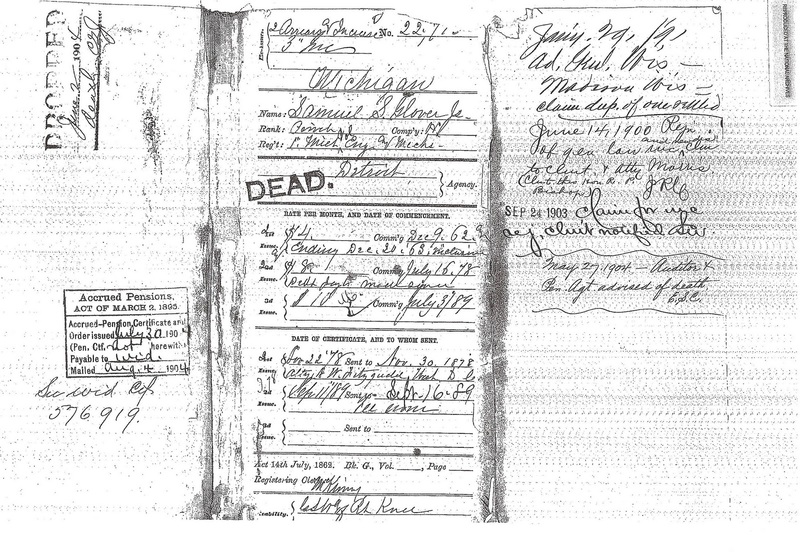 Of course, we know our ancestors are dead, but seeing it stamped in bold, black ink is a little unsettling. The excitement of receiving my great-great grandfather's, Samuel Stillman Glover, Jr, civil war pension file was soon dimmed upon seeing the cover. The reality of his life and death were forefront in my mind. The cover provides information on his rank, company and regiment; pension rates and date of changes; widow pension information and miscellaneous pension information. It was only the beginning of what has provided me with some great genealogical information. I think I have researched every Frank Glover, who was born between 1862 and 1864, in the 1870 United States Federal Census. There were seven that fit that category. I only went down the wrong path once, so that wasn't too bad. Of course, the seventh one was the correct one! Once I found the correct parents, I had pretty smooth sailing back to the 1600's in Massachusetts. 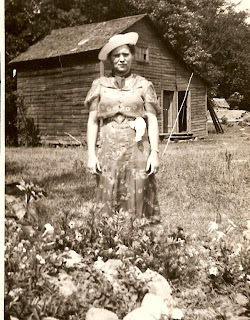 My grandmother, Daisy Graf Fredricks, lived a simple life as a farmer's daughter and wife. She lived a humble life. She was a kind, loving, Christian women with a wonderful laugh. She didn't have a lot, but anytime I visited her she made me feel welcome. Our family usually visited her at least once a year. So, when my mother asked if I would like to have a creamer that belonged to her I said, "yes". I think this is the only heirloom my mother had from her mother. It is special to me because of this. In the spring, I use it as a vase. It is in pretty good condition. Although, it does have one small chip on the spout. I think she would get a chuckle out of my using it. She probably doesn't think anyone would want "that old thing". She was like that. The creamer is a waffle pattern with scallops and real? gold on the rim. It is a pressed glass cream. I imagine my grandmother pouring her fresh cream into the small pitcher in the morning for her coffee, or maybe for fresh strawberries. I have a faint memory of it on her table at her home in Brethren, Michigan. I may have been having a snack at the time, probably cookies. Grandma Fredrick's creamer is one that I will treasure for years to come. Source: Samuel Poor; Document Number 12757; United States Bureau of Land Management "General Land Office Records: Land Patents," digital images, Bureau of Land Management General Land Office Records (www.glorecords.blm.gov: accessed 12 October 2011). 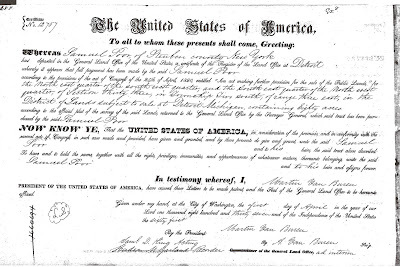 The above record states that" Whereas, Samuel Poor, of Steuben county New York has deposited in the General Land Office of the United States, a certificate of the Register of the Land Office at Detroit whereby it appears that full payment has been made by the said Samuel Poor according to the provisions of the act of Congress of the 24th of April 1820, entitled "An act making further provision for the sale of the Public Lands" for the north east quarter of the south west quarter, and the south east quarter of the north west quarter, of Section thirty three, in township two south, of range three east, in the District of Lands subject to sale at Detroit Michigan, containing Eighty acres according to the official plat of the survey of the said lands, returned to the General Land Office by the Surveyor General, which said tract has been purchased by the said Samuel Poor." 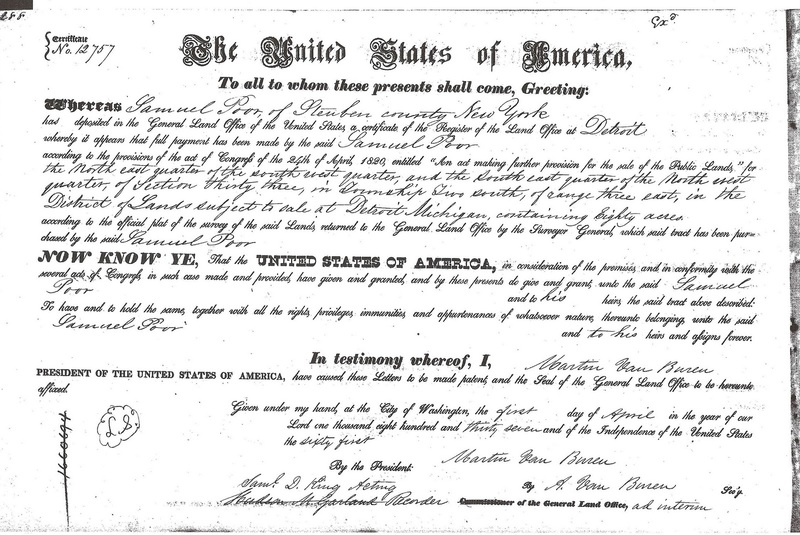 Michigan was barely two months into statehood when my ancestor, Samuel Poor, was issued eighty acres of land in Washtenaw County, Michigan. 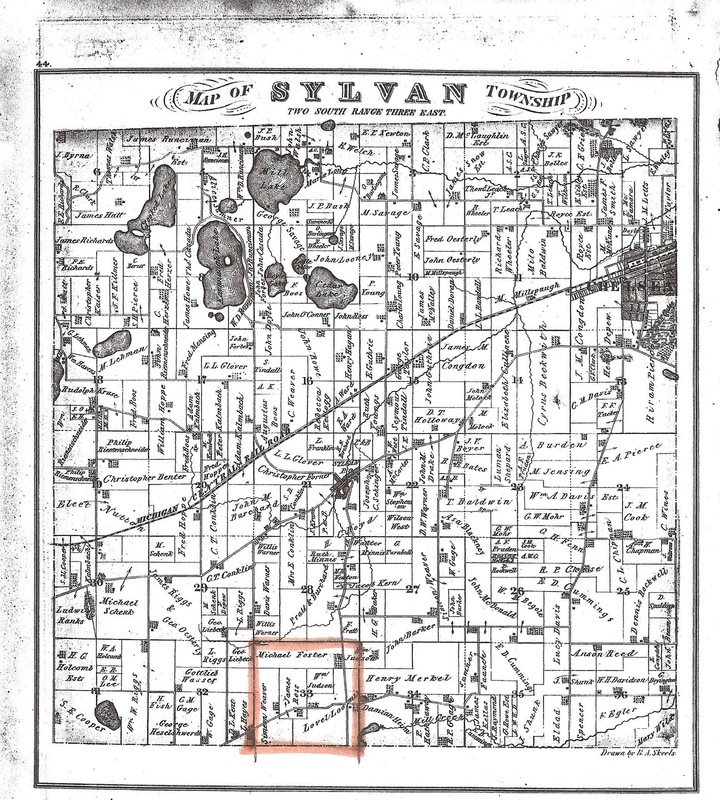 Samuel Poor's land was in Township 2S-Range 3E, which is Sylvan Township, it was the Northeast quarter of the southwest quarter and the southeast quarter of the northwest quarter of Section 33. 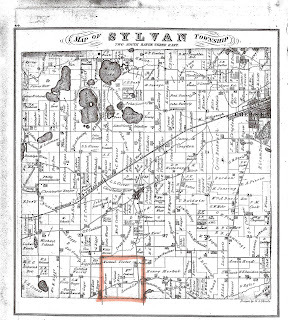 The highlighted section of the map below is Section 33 of Sylvan Township, Washtenaw County, Michigan. This map is from 1874 and there aren't any Poor's living in the area at that time. 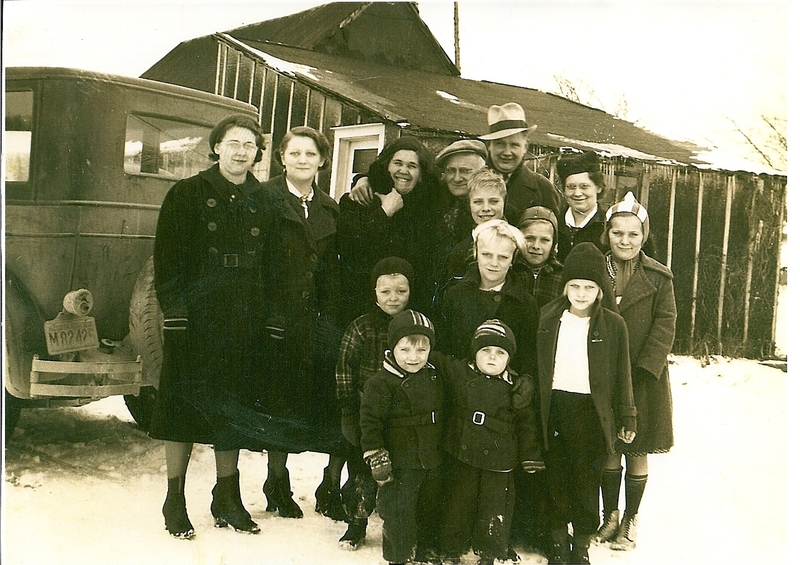 This picture of the Fredrick family was taken in the late 1930's. It is one of the few I have seen where my grandfather, Otto Fredrick, is smiling. Plus, he has his arm around my grandma, a rare showing of affection. I have a couple of pictures that were taken with this house in the background. I had assumed that it was on the family farm. I was looking at it with my mother and I asked where this was taken and she said it was taken at the home of William and Mary (Graf) Tritten near Brethren, Michigan. Mary Tritten is Daisy Graf Fredrick's sister. You may notice that I spelled Richard's last name as Frederick. That is the spelling that is used on his birth certificate and he used that spelling throughout his life. The obituary below is for my maternal aunt, Kathryn Louise Tritten Pihl. The obituary was found online at the funeral home's website, Terwilliger Funeral Home in Kaleva, Michigan. Kathryn Louise Tritten Pihl, 93, of Manistee, formerly of Brethren and Kaleva, died Monday, January 2, 2012, at the Manistee County Medical Care Facility in Manistee. 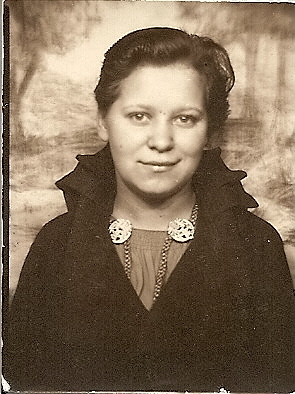 She was born September 6, 1918, in Brethren, the daughter of Otto and Daisy (Graf) Fredricks. Kathryn worked as cook at Norman Dickson School. Later in life, she went on to become an LPN and worked as a nurse for several area physicians and at Memorial Hospital in Onekama. She also served her community as Dickson Township Supervisor. Kathryn was a member of Trinity Lutheran Church in Onekama and Manistee. She was a member of the Trinity Lutheran Ladies Guild, in Onekama, and also served her church as a Sunday School teacher. Most of all, Kathryn loved to spend time with her family, especially with her grandchildren. 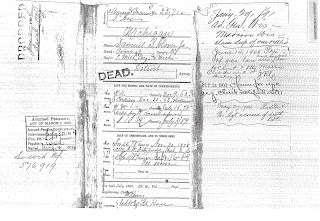 Kathryn is survived by: her children, Kathryn (Thomas) Welch of Barnesville, Ohio, and John (Susanne) Tritten in Manistee; 9 grandchildren, Thomas (Betsy) Welch of Barnesville, Ohio, Timothy (Pam) Welch of Barnesville, Ohio, Mark (Beth) Welch of Matthews, North Carolina, James (Connie) Welch of Humble, Texas, Dennis Welch of Barnesville, Ohio, Eric (Christine) Tritten of Stow, Ohio, Heather (Jason Youngstrom) Tritten of Denver, Colorado, Brian (Kimberly) Tritten of Savannah, Georgia, and Timothy Tritten of Mainistee; 18 great-grandchildren; 8 great-greatgrandchildren; 5 siblings, Lola Brown of Brethren, Richard (Marilyn) Fredericks of Brethren, John (Louise) Fredricks of Blanchard, Audrey (Bruce) Glover of Portage, and Norma Jean (Leslie) Kaskinen of Bellaire; and numerous nieces, nephews, and cousins. On May 8, 1938, Kathryn married Carl Henry Tritten who preceded her in death in 1970. She was also preceded in death by: her second husband, Russell Wayne Puryear in 1989; her third husband, Weikko Alvar Pihl in 1994; her parents; and 6 siblings, Harold Fredricks, Daisy Marie Kurth, Leona Wagoner, Ray Fredricks, Norman Fredricks, and Otto Fredricks. Funeral services will be conducted at 10:00 AM, Saturday, January 7, 2012, at Trinity Lutheran Church, in Onekama, with Reverend Eric Tritten officiating. Interment will follow in the Brethren Cemetery. Visitation will be held from 2-4 PM and 6-8 PM, Friday, January 6, 2012, at the Terwilliger Funeral Home, in Kaleva. Memorial contributions may be made to the Sonshine Ladies of Trinity Lutheran Church in Onekama, Trinity Lutheran Church in Manistee, or to Concordia Seminary, Seminary Advancement Office-Loeber Hall, Concordia Seminary, 801 Seminary Place, St. Louis, Missouri, 63105-3196. The Terwilliger Funeral Home, in Kaleva, is in charge of arrangements. Travis celebrated his 1st birthday on a very snowy day. The weather was so bad that no one could come and celebrate with him. Kirk, Kirsten, Travis and myself celebrated at our home in Kalamazoo, Michigan. Travis excited about opening his gifts. The celebration included opening gifts that were sent from Grandma and Grandpa Glover, Aunt Nancy and Uncle Neil, who were living in Texas at the time, Kirsten, and us (Mom and Dad). You received clothes (a warm up suit, blue jeans, Dallas Cowboy sweatshirt), toys (Pop Up Pals, Animal Sounds Barn, Teddy Bear named Radar) and Money. Travis loved his bear, Radar, that his sister, Kirsten, gave him for his birthday. Radar was Sesame Street's Big Bird's bear. This bear was so soft and cuddly. Travis loved the bear to the point that Radar eventually lost a leg and an arm. Travis wasn't so sure about the cake, but the blueberries looked good. Your birthday dinner included one of your favorite foods at the time, turkey and pasta. I made Turkey Tetrazzini. A birthday cake of angel food cake topped with blueberries was enjoyed. You weren't too sure about the angel food cake. You took the cake off of your Mickey Mouse paper plate and licked the blueberries. A Happy 1 Year Old! I hope Travis is enjoying his birthday, today, as much as he enjoyed his 1st Birthday. Happy Birthday, Travis! I wish I could be there to celebrate with you. 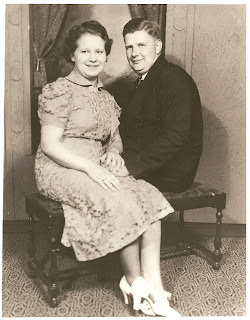 I wrote about the worlds of genealogy and theatre colliding and my daughter's connection to it in a post titled "The Worlds of Genealogy and Theatre Collide". I had the privilege of attending Light Opera Works in Evanston, Illinois production of 'The Secret Garden' this past weekend. The Secret Garden musical is filled with beautiful music; music that you feel in your heart and soul. My heart and soul was filled with pride Saturday night. Pride that my daughter is following her dream of being a musical theatre performer. Watching her perform is a joy, one that I cherish every time I see it. Pride that her great, great grandparents were an inspiration for costumes. 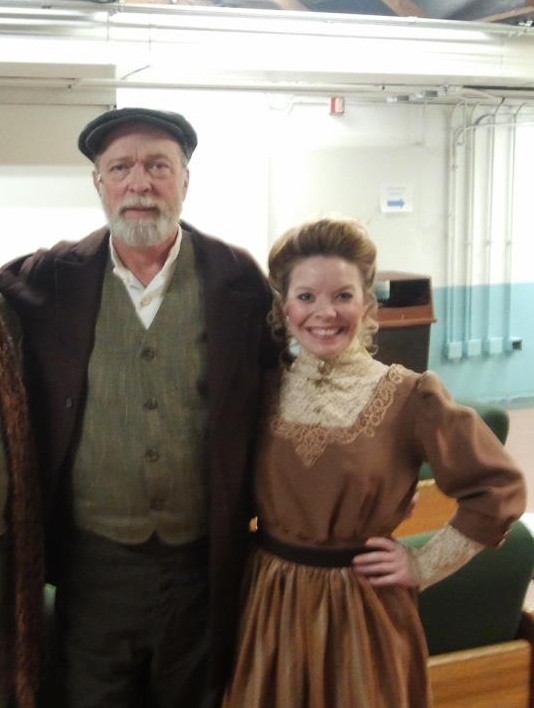 I sat in the audience as the characters of Ben, the gardener, and Martha, the housekeeper, entered the stage. 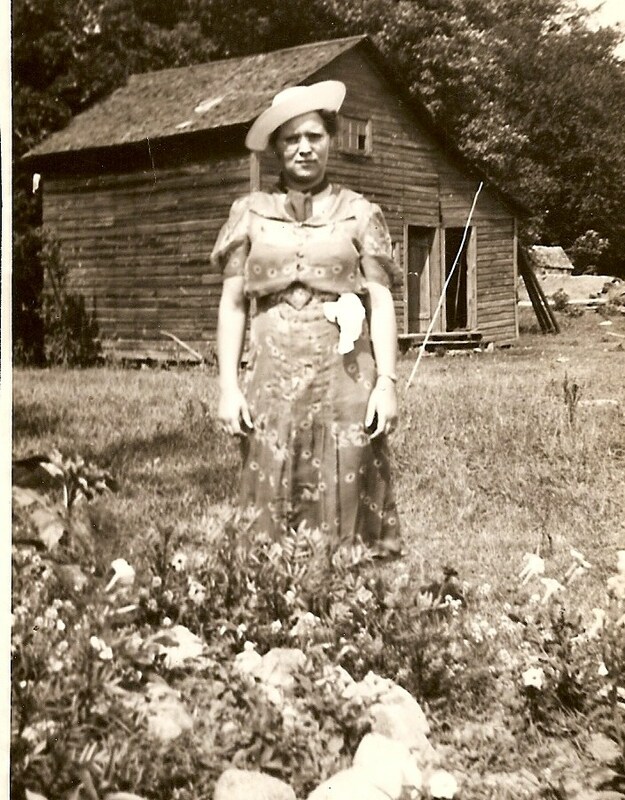 I knew that my great grandparent's picture was the inspiration for their costumes. I am still in awe of the coincidence. Even Kirsten was touched by the coincidence. She said, "I'd seen that photo of the Fredricks' a handful of times, but I never expected to see it at a design concept presentation! They put the photo up on the costume plot board and I had to look twice...then text my mother asap! As actors and designers, we always are looking at images for inspiration and research, but you never think you'll see photos of your own family. 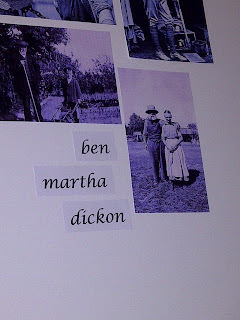 When I told some of the cast members that the photo was of my great great grandparents, the response was "no way!" It was a cool moment." Here is the picture of Johann August Fredrick and Louise Fredricke Zastrow Fredrick. The one used as costume inspiration. And, here is the picture of Ben and Martha from Light Opera Works Production of "The Secret Garden"
My Aunt Kate passed away last night. She was more like a grandmother to me than an aunt. I have very fond memories of her. Although it is sad that she is gone, I know she is free from the effects of Alzheimers. I will remember her and the wonderful times I spent at her home. My thoughts and prayers are with her family at this time. Rest in peace, Aunt Kate. Research, record, and source vital record information for my mother's 11 brothers and sisters. Research Vinera Eglantine Powers parentage. Read research wiki's or courses twice a month. Finish the Glover surname file labels, using Family Roots Organizer System. Setting goals motivates me in my genealogy research. Additionally, it focuses my attention toward completion of the goals. Do you set genealogy goals? Why or Why not?